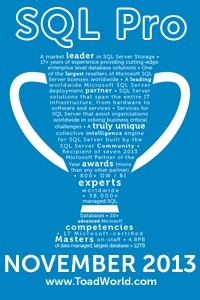 It’s TSQL Tuesday again! This time our respected host is Bert Wagner (b/t). Quick aside, if you haven’t seen his vlogs before take some time and watch a few. They are entertaining, informative and best of all short :). I’m really enjoying the work Bert! Keep on trucking! Anyway, this time around Bert wants us to post some code that we use that we just can’t live without. That’s a bit hard for me since I’m constantly posting about code I’ve written or enjoy using. So here is my solution (<- pun there, you'll get it in a second), a while back I wrote about using solutions (see? I thought that was rather funny myself.) in SSMS to store the scripts I use on a regular basis. So I thought this time around I would go through and create a list of links to the sources for many of the most useful scripts. Notes are just that. Pieces of scripts, or a series of scripts to remind me of things. Query means that this is something I can open and run without much input. Frequently there are commented out parameters or variations. But in general I can just open and run. SPs These are create scripts for SPs that I use on a regular basis. I keep them here because I work with hundreds of servers and I’m never sure which ones have them and which don’t. Also a lot of times the documentation is at the top of the script. Notes – Extended Events: No link here since these are just random sample queries of some of the system tables. Notes – xQuery: Pretty much the same as above. Just some random samples I can use to copy and paste. Query – Generate DBMail setup scripts: I haven’t tested this a whole lot yet, but it seems pretty good. Query – What’s going on: Collection of parameter combinations for sp_whoisactive, and some simple queries to find/remove -2 spids, list of sessions with locks on a given database etc. Query – Where is my backup: Also includes templates for taking a backup and doing a restore (with MOVE). And last but not least, some of these (the What’s going on & Backup scripts) that I use that most often I pin to a separate tab row.